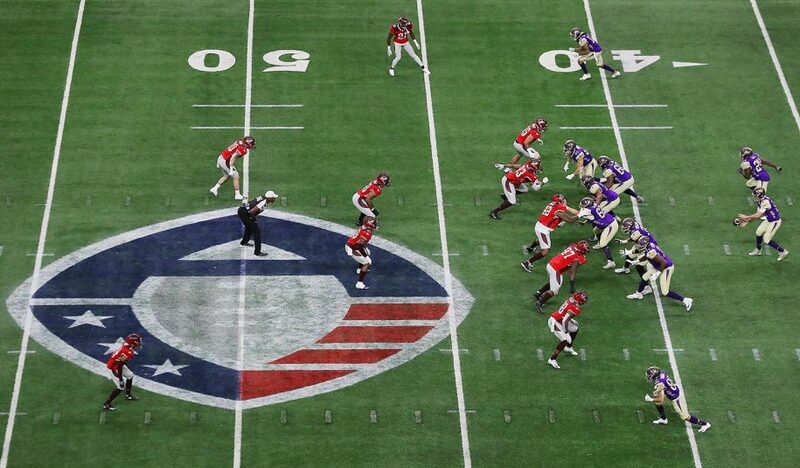 SMT (SportsMEDIA Technology) is providing the new Alliance of American Football professional spring league with a full arsenal of broadcast solutions, including virtual technology and statistics. Throughout the league’s 10-week season, which kicks off on Saturday, SMT will supply Alliance broadcasters with traditional graphics, such as the scorebug, along with its Emmy-winning virtual 1st & Ten line platform, and its QB Stats prompter — the same systems used to produce Sunday’s Super Bowl LIII. SMT’s team of broadcast specialists will provide technology for the Alliance’s four games per weekend: two produced as traditional onsite broadcasts from stadiums and two produced remotely from Sneaky Big Studios in Scottsdale, AZ, where in-game announcers will call the plays, Skycam cameras will be operated, and SMT’s traditional and virtual-graphic elements will be inserted from the control room. Founded by film and TV producer Charlie Ebersol and Pro Football Hall of Famer Bill Polian, the Alliance of American Football comprises eight teams in eight cities, which will play a schedule that culminates in two playoff rounds and a championship game on April 27 at Las Vegas’a Sam Boyd Stadium. Head coaches include names like Steve Spurrier, Mike Martz, and Mike Singletary. The league’s broadcast and distribution partners include CBS, CBS Sports Network, Turner Sports — TNT and B/R Live (Bleacher Report) — and NFL Network.